During the Student Government (SG) presidency of Greg Pollock (2011-2012), the TE3 was introduced. The TE3 is a bus service that allows RIT students to venture into the city of Rochester over the weekend for free; it still continues and has become a popular service and a part of the campus’ culture. The service also allows students to find new and adventurous things to do outside of the RIT main campus in Henrietta. The TE3 was originally supposed to be in a testing phase in order to move to a paid model in the future. While plans for that change are still in the works, finding the right way for students to adapt has been a challenge. 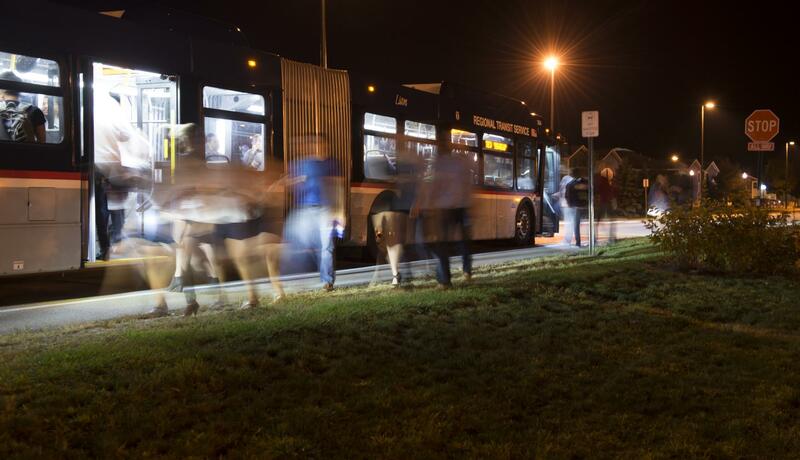 Paul Darragh, a fourth year Software Engineering student and the SG president for the 2013-2014 academic year, had been working on modifying the bus service to move the service toward the paid model. Currently, the Parking & Transportation department pays for the weekend service and will be doing so for the rest of the year. The service was planned to cost $1 per student per ride. The main issue was finding a way to make the payments quick and painless for students. The plans that were in the works for the paid model included the use of punch-cards that students can purchase on campus that would allow them to ride the bus. A few of the immediate problems include students losing or forgetting to buy a card whenever they wanted to ride the bus. It would also add an additional cost for RIT to have to purchase the cards. Talks with the bus company, Regional Transit Service, were set to try to find ways to integrate student IDs into bus payment. Nothing significant has advanced from those conversations yet, but Darragh said he would like to see the current SG check up on its status. “I would love to see them [SG] check up and see how it’s going, but every year’s SG has its different goals and visions,” he said. Ashley Carrington, fourth year Finance and Management Information Systems majors and Current SG president, doesn’t foresee any changes to the system this semester and is sure that the service will stay free for the year. She said she doesn’t have any current plans to continue what Darragh had started unless advances are made that require SG’s attention. “If it were to change and it actually affected students, then it would be something that would be handled by Student Government,” she said. She noted that Parking and Transportation works hard to accommodate students as much as they can. If changes are to be made in the future, she said she is confident that they can handle them with the students' benefit in mind.